On the 2nd July 1919 RAF Airship R34 set off from East Fortune air base near Edinburgh heading for Mineola Long Island United States to attempt the first Atlantic return flight. 100 years on from this famous flight correspondence and related items are to be sold in 28th March 2019 Arms and Militaria Auction. Captain Reverend George Davys Jones his letter and his sister Hedone (Donie) Augusta Jones. 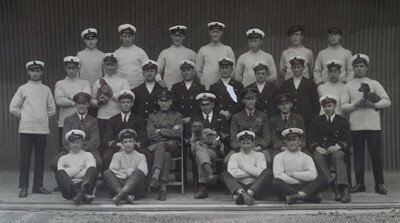 Official press photograph of Airship R34's crew including pet cat and dogs which went onboard this significant flight. 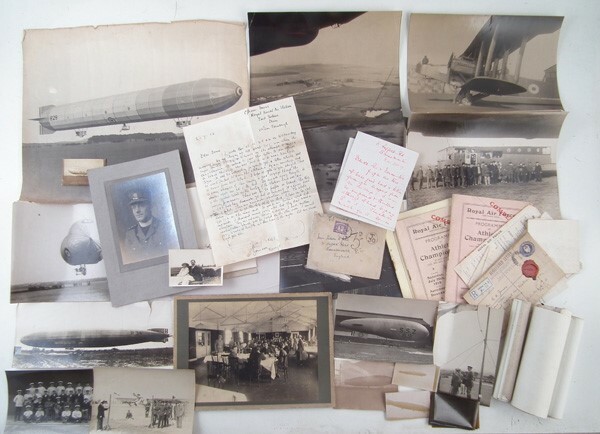 The lot contains seven photographs of different RAF airships, a photo of a Handley Page twin engine biplane, forty tightly rolled aerial photographs many dated 1918, mostly of Musselburgh, as well as a collection of RAF paperwork, railway warrants, and sports programs and relating to George’s service in the force. Photographs, correspondance and other RAF paperwork all included in the lot to be sold in our 28th March Arms and Militaria auction. George Davys Jones (1884 – 1975) was the fifth of seven children. Educated at St John’s College, Ystrad Meurig (where his father was headmaster) and Jesus College, Oxford where he studied the Classics. In 1916, when there seemed to be no end in sight of the First World War hostilities, he joined the forces, taking up a Chaplaincy in the Army. He was stationed at Dovercourt, Harwich in Essex and then at Herne Bay, Kent with the Welsh Reserve Brigade. On one occasion he preached at a special service held at Canterbury Cathedral. At the outbreak of the Second World War in 1939 he joined the Home Guard and became an Air Raid Warden.